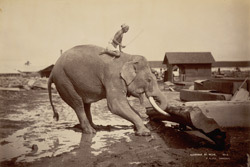 Photograph of an elephant at work in a timber yard at Rangoon (Yangon), Burma (Myanmar), taken by Philip Adolphe Klier in the 1890s. This view shows the elephant shifting a baulk of teak using its trunk with the mahout seated on the animal’s back. The Asian elephant has laboured for man for centuries. Burma still has the world’s largest herd of working elephants, most of which are used in logging and agriculture. The country’s vast mixed deciduous forests are one of its greatest natural resources and as long as the forests remain the working elephant and the ancient traditions that go with it are perpetuated, although mechanised logging and decimation of forests has reduced the populations of elephants elsewhere in Asia. In the 19th century when it was under British rule timber (particularly teak) was one of Burma’s three principal export commodities, the others being rice and oil. Timber was extracted using elephants and buffalo, and floated in rafts down rivers such as the Irrawaddy (Ayeyarwady) to timber yards and saw mills in Rangoon and other towns where it was classified and sold locally or sawn up for export to Europe. The photograph is from an album devoted almost entirely to Lord Elgin's Burma tour of November to December 1898. Victor Alexander Bruce (1849-1917), ninth Earl of Elgin and 13th Earl of Kincardine, served as Viceroy of India between 1894 and 1899.